The alarming aspect of a Japanese bank (Norinchukin Bank) that has just filed for bankruptcy protection is that it was bank that was not listed on the public markets. It was a private bank with over 4000 investors. Although it will be large enough to cause a ripple effect through the Asia markets in particular causing the HK dollar and iTraxx credit spreads to widen. I did indicate that a Japanese bank could be on the brink, that was briefly discussed in Consumers will punish the financial system for governments exuberant money printing – Be careful on equity market ‘rallies’ into next year. This bank failure in Japan is not so much of a shock but more a revelation that the Asia banks (outside from Japan) could be now straining to hide any toxic junk they have. But regardless I suspect it will cause a withdrawal of confidence that Asian banks could somewhat come out unscathed from a global banking crisis. 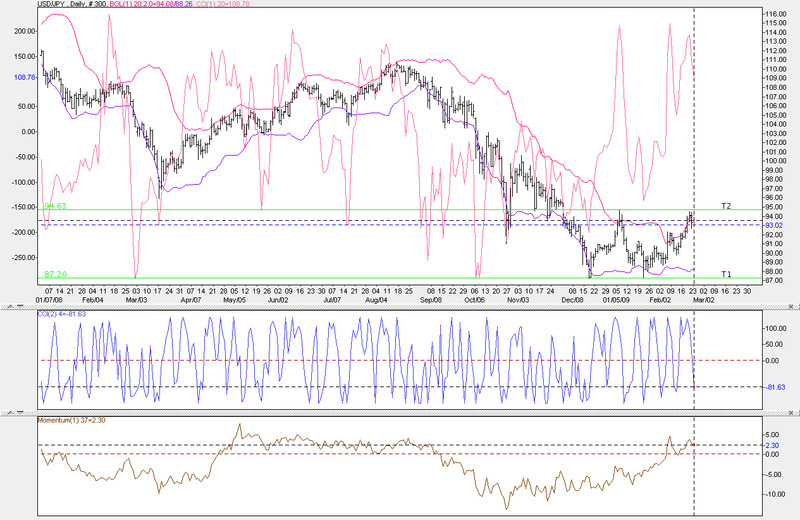 In saying that it would be worth watching movement of the Japanese Yen. There was speculation that risk aversion could send a reversal of the Yen highs, meaning the US dollar could gain ground with possible highs over the Yen. This didn’t happen short term, as the US Obama administration with their incumbent Reserve Bank could nationalise the whole US banking system (considering the bigger US banks total 20 different banks – all earmarked for huge Government equity stakes). This would further destabilize the USD as investors will be petrified at the massive moral hazard the US government will embark on; the stock market will sink on any reports of nationalisation as will the USD. This can be seen in the below graph, speculation that the USD could reach 100 against the Yen were diminished after risk aversion caused the USD to be dumped and the Yen to be bought up again. On a daily USD/Yen graph: Mometum at 37 days (last two lows) is showing a decline, CCI (1) 20 overlapped with the USD/Yen is showing a sharp decline, the CCI (2) is showing a sharp decline that could mirror lows made on 16 DEc 2008 when the USD touched 88 against the Yen. Market rallies flop into new year January 2009. 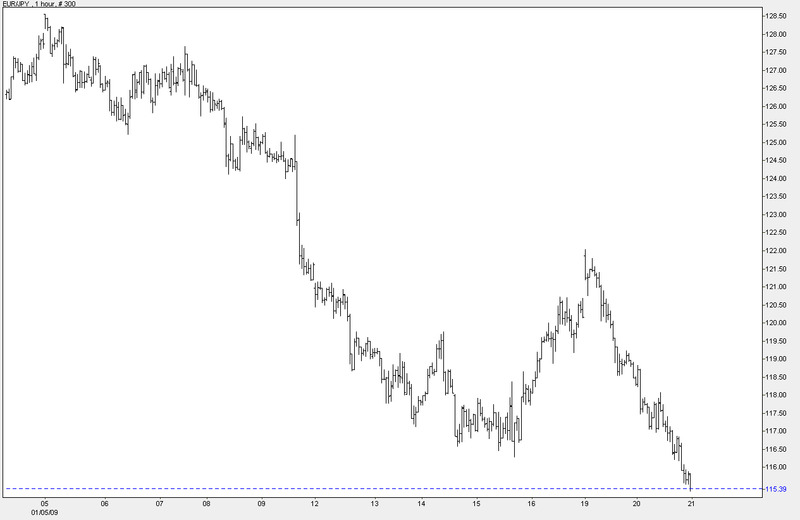 Big sell soon on the Australian Dollar. I wrote a blog post in November 2008 titled Confused markets, deflation/stagflation threats and our old friend gold. The post detailed that I personally did not see extended or significant rallies in global stock markets into 2009. As it turns out that January 2009 was the worst month in history for the Dow. Although it was said that a rebound could occur from January 2009 to March 2009 this appears unlikely, as new lows may continue into March 2009. The volatility has fallen off somewhat, some commentators claim that the markets are unsure, hence the term that I use ‘confused markets’. But I think the market is now factoring in the absolute failure of the global economy in 2009, rather that potential upsides from Government intervention. In fact in my opinion the market now have factored in that government intervention does not work and won’t work to stimulate the markets, so a downside persists within the current market psychology. So it could be argued that the market is looking for that bottom, ignoring government intention as a possible market primer (as mentioned it has failed overall only effecting the bond markets factoring in a massive US deficit and the currency markets pricing in rapid value destruction of the US dollar). The main sell will be the AUD, already crunched dramatically last year 1st October 2008 bouncing off .60 cents from highs of .98 cents (July 1st 2008). 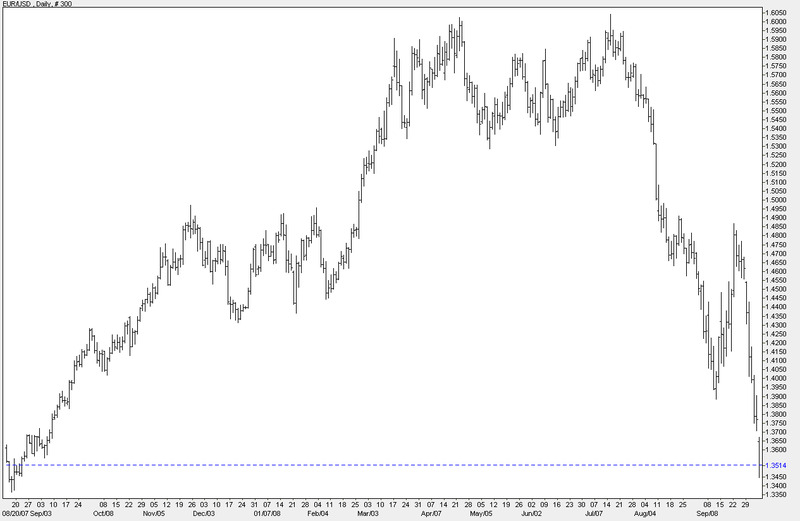 The AUD is is trading in a very tight range between .65 and .62. Both CCI’s show a slight recovery from an over sold AUD, I would say that is temporary with the AUD going to come under huge pressure again breaking through support of .62 and falling lower under .60. All this depends on the government of Australia trying to raise capital from it’s debt and combined with private capital investment leaving Australia. Eventually Australia will have a bond down grade and will lose it’s credit worthiness. The economic crisis that is gripping the banking sector and inter market credit markets, has polarized governments to establish an intervention problem beyond anything seen in the history of capitalism and global markets. As discussed numerous times on morbius glass this intervention is short sighted and dangerous for the future of market stability. So this economic crisis could have essentially burnt it’s self out albeit harshly, but that is the down side of capitalism; you play markets in boom times expect at some point a bust. That is the reality of markets. Still the belief that government intervention from fiscal stimulus to bank and company bailouts will work, has now developed into a frenetic hysteria of ‘bailouts’. Of course this will lead to the next crisis, or more correctly has exasperated the next crisis which in all retrospect could be worst than the credit markets imploding. So with global economies and the markets still collapsing, the unsure aspect and volatility will continue to erode confidence. A widespread panic is developing again this could be the final drop in global markets, particularly stocks. But currencies are an excellent bellwether to it’s perspective economies. The next crisis (and this could be sudden) could be accumulation of two things both leading into each other as a severe blow to a countries economic stability. The first is currency destruction, which is now happening on a broader economic front, as all countries have gone mad with stimulus packages and bailouts. A risky disposition under the false pretense that somehow countries will avoid a nasty bout of inflation down the line. We know this as untrue as inflation may not have entirely disappeared. Declines on discretionary items may have fallen dramatically, but I still hear and see increase in energy bills, food. Although containable at this point, it is not unfeasible to see a spike in food prices (depending on weather and climate change) and even oil (depending on the geopolitical volatility of the middle east and output shrinking/costs increasing). When the UK recently decided to bail out RBS, claiming to 70% ownership of the company. The Great Britain Pound was immediately sold off, this was also on news the the UK government would insure credit worthy mortgages and guarantee bank debt. Not just for one bank, but for all banks. Hence the market factoring in that the UK government has now taken on huge risks, including the Bank of England’s terrible balance sheets which now rely on money printing to continue the flow into the UK economy. Not only does a falling pound represent the losing value of it’s worth, but the risk now of a country that may find it hard to raise capital; it’s government debt could be downgraded. As was Spain’s recently, also Portugal, Greece, Italy, Ukraine. Germany, France and the UK are close to be downgraded as credit worthy nations, in other words no one will want the debt. With Ireland recently threatening to pull out of the EU if it isn’t bailed out by the EU also effected EURO. The crisis is now in a panic phase, that extends not just from the credit/banking crisis; but politically. As politicians attempt to save their own necks, they are inevitably causing more harm to economic stability than good. It’s a ripple effect, that is becoming more an more pronounced. Disproportional and ‘ad hoc’ intervention is creating far more volatility and market panic, if they were to just allow the markets to correct itself naturally. In saying that, the EURO was sold off dramatically when Standard and Poor down graded Spain’s sovereign debt, this is a warning shot to the FX markets; that European countries all could be downgraded in someway. With Ireland and Spain who are both extremely over leveraged especially in the property markets. One of the better currencies (not in value) for measuring risk and volatility in the global markets is the Australian dollar. Once a favorite in carry trading, especially with Japanese FX traders. 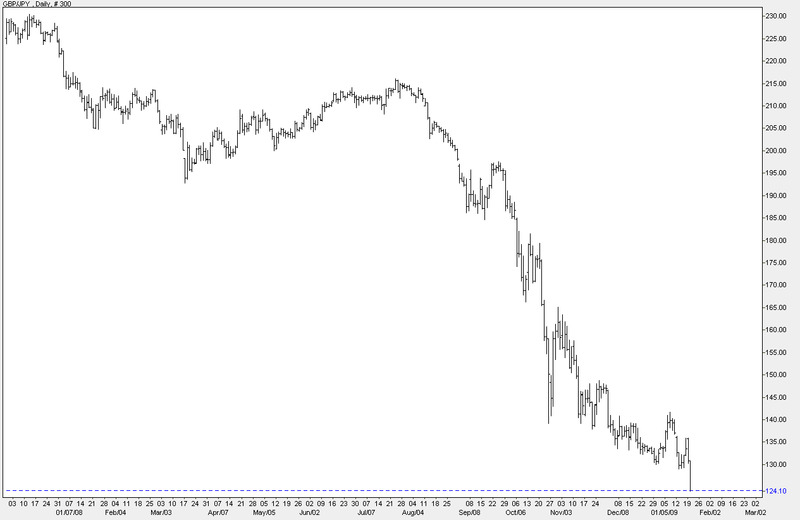 The AUD collapsed timed with the stock market collapse in September 2008 from .85 down to .60 in October 2008. Now bouncing around in a wide volatile range between .60 and .72, this would indicate the extreme volatility in the global markets. 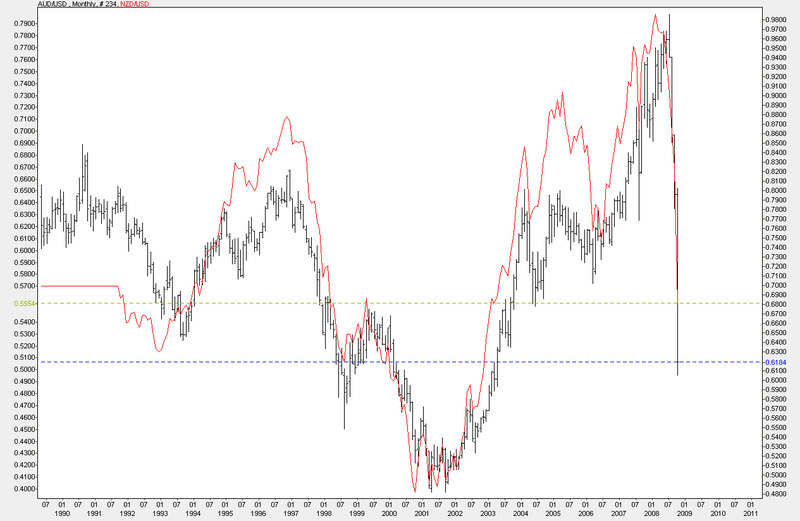 Although now the AUD is on the downside again, it could most probably breakthrough the .60 support. Especially if Australia gets a rating downgrade, or the Reserve Bank cuts rates aggressively in the coming months. Also to note is Australian government intervention in the banking sector of local credit markets. 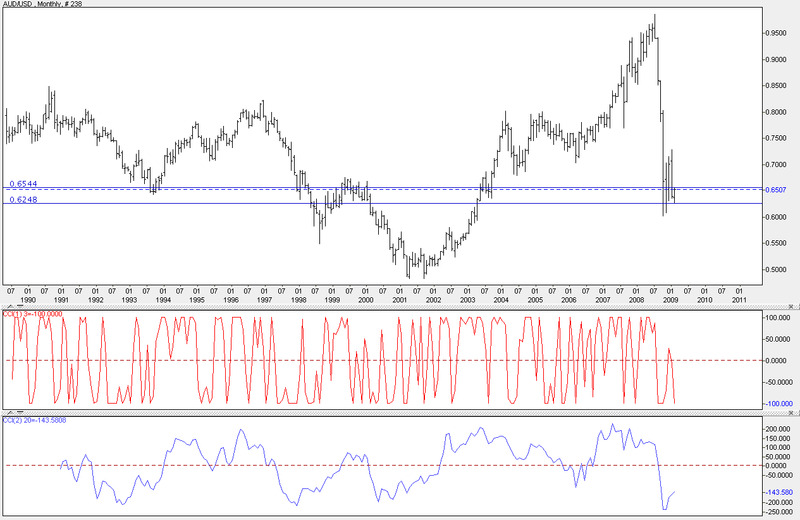 Other factors global too watch that will effect the AUD is the commodity markets, when or if a recovery occurs soon. Which may be unlikely in the short term. Watch Global Currency markets. Country bankruptcy ‘endgames’. Hungary, Ukraine, Argentina, South Korea are countries that could cause a domino effect (within their regions) of risk aversion and panic, sending ‘interconnected’ economies into free fall. Bank of Korea just slashed rates down 0.75%, now siting at 4.25%. The South Korea Won has been hammered in the currencies markets, the barometer of a country’s economic situation is their currency. The Won is indicating that South Korea is going to be hit hard by the major consumption economy (USA) prolonged recession , this may cause the rest of Asia to go into a meltdown. Hence Asian markets liquidating stocks and running out of stocks into the Japanese Yen, powering the Yen to all time highs. This has caused the Yen to be favored over the Euro, which as one point was at 1.66 Yen on November 6th 2007, the Euro now is facing down, a good chance it could bounce off 1.00 Yen. This by no means indicating that the Japanese economy is booming, in fact Japan is a country that is so negative with an ailing stock market, the general market that doesn’t know where the bottom could be – the Nikkei could go much lower before any kind of rebound. 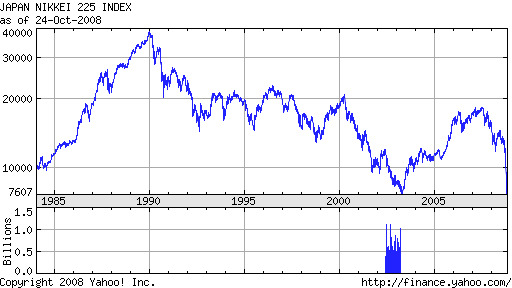 Nikkei (225) 23 yr graph, note the highs in 1990 just shy of 40,000 points, through to the current 7,649. That is 18 years of losses (long term)! The Japanese YEN like the US dollar are considered low risk as opposed to the EUR, it could be surmised that European economy is collapsing more dramatically than Asia and the US. Ukraine just being bailed out by the IMF, Hungry cold be next and other European countries namely Eastern European could all start to face the reality of defaulting. Of course the big question is Russia’s economic situation? The constant reminder of volatility in the market is the intervention of all the global central banks and governments; this intervention is of course delaying a huge invertible outcome. Thus at the same time causing a market to become even more jittery. One can solely blame intervention by global governments and central Banks for the volatility, check the VIX out: incredible. The market simple can’t find a bottom. With a accelerated global slump occurring the worst thing the central banks and governments can do is pump money into the system and cut interest rates. Especially with the extreme market volatility with emerging and developed economies currencies. A range of currencies will be sold off dramatically in the market, if Argentina or a European country or countries start knocking on the IMF door. If South Korea looks for a bailout package, expect the Australian Dollar and New Zealand Dollar to crash below current supports. With the AUD most definitely heading below 0.60. The Treasury and the Federal Reserve will bail out the WHOLE American banking system. (Updated 2) – All distressed debt on the table, cracks now appearing in the ‘plan’ USD sell off, commodities rev up. As the Treasury and Federal Reserve bail out proposal of the whole US (and possibly even global) banking sector gets approval via congress. It has to be kept in mind that the approval for such a broad institutionalization, or protection of banks and the finance sector, is no way a broader effort to bail out the indebted/poor American citizen. Who, as it has been discussed will be footing the bill of such bizarre and in someways desperate measure to stop the rich from going into recession. The dangers are immense in this ‘bail out’ scheme, obvious at this point with a Trillion plus money pledge to buy banks distressed assets, it’s effect on inflation and devaluation of the US dollar. Traders will be now trying to bet at which way the US economy will go, whether a deflation recession, or stagflation recession. With the new bank bail out proposal it appears to be a stagflation ‘severe’ recession looming; just as the commodity markets were adjusting to a US slowdown, the USD strengthening. Then Federal Reserve (under Ben Benanke) and US Treasury (under Henry Paulson) whack this badly thought out plan of propping up badly run banks and their losses. The commodity markets, being relatively good safe havens to inflation, may start to rally again. The market will of course tear this plan apart with due skepticism, more notably the problems with asset valuation and the buying of distressed debt at discount from banks. In other words, to what extend should the bailout cover the toxic assets of bank, which in some cases could equal the value of the bank itself, say 100% (remember AIG insurance was 80% junk). Which would essentially qualify as a complete takeover from the US government. Otherwise the bank with it’s ‘junk’ bought at a discount, may find it hard to function – after selling it’s distressed assets at a cheap rate to the US government. Hence they might as well close up shop anyway. With broader consumer markets in recession, it has to asked how a bank which has had it’s toxic waste disposed of return to profit? Or, do they scale down, horde cash and sit it out – likely scenario. If this is the case banking stocks will still come under pressure with no real recovery occurring (in the bank sector). The Foreign Exchange markets may be good indication of the soon to be worries of the USD under a lot of pressure. Politicians who should be looking after the interest of the electorate have now helped distinguished the two separate economies in markets, the banks, Wall Street and main street. This plan will essentially shut off main street from the finance markets; insulting the banking world from further losses (but as discussed this plan may still not stop the banks running at a loss – even if they do disengage from the broader economy and it’s ills. The banks may just become corpses kept alive with government money). Of course main street will go further into recession. A dreadful distortion of free markets, as the powers at be are now reshaping and protecting the gamblers who caused their own markets to meltdown. Gold has risen from lows of 736 (11th September 2008) to highs of 893 (18th September 2008 – gain of 157). Although the current price spike (17th and 18th September 2008) is the historic aspect, to rise as quickly as it has in a short period of time is impressive. Although note as discussed in The world is most likely in Recession, gold was showing signs of instability in the lower price ranges; so a large rally was on the cards. Of course in light of the now recognized meltdown of Wall Street and the world’s finance sector, the spike in the gold price was exasperated even further; as liquidity comes rushing bank into the commodity markets. 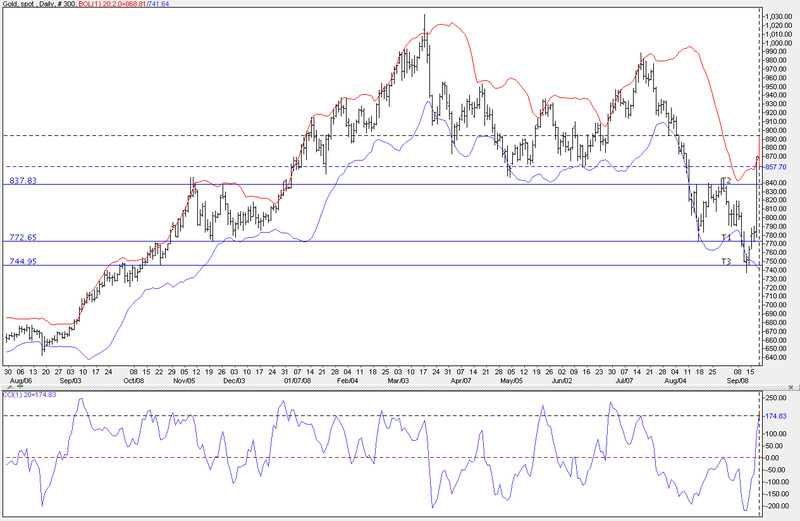 After bouncing off support of 744, gold has now passed over supports of 772 and 837. 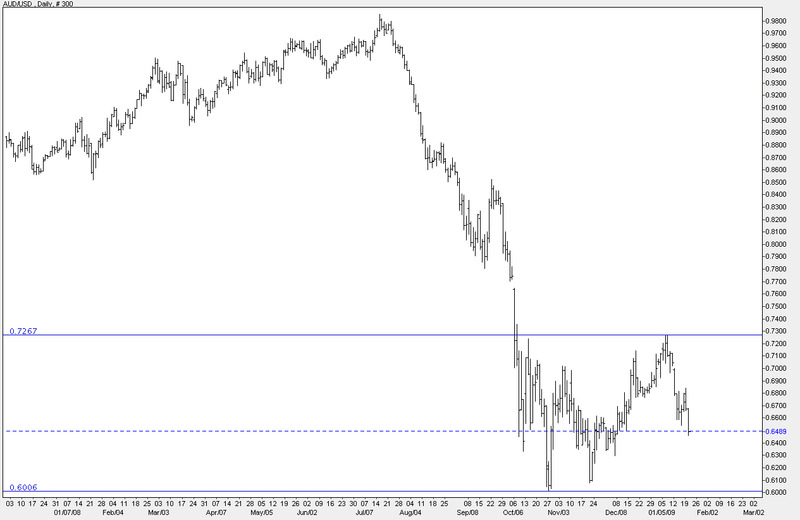 Now moving into the trading range of 857 and 931. 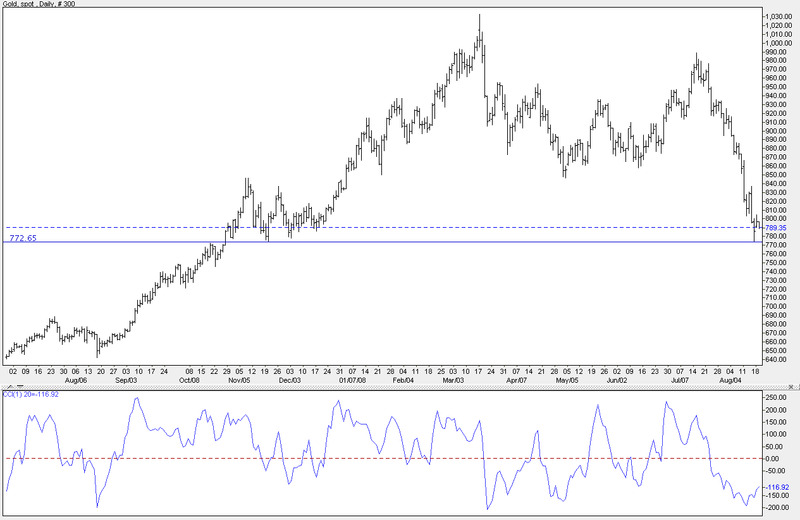 Gold could hit a peak of 900 (short to medium term), with some selling (trigger selling) to occur. But as long as the USD get’s crushed and bank failures continue in the US and Europe, the credit crisis migrates to a broader liquidity crisis. Gold will continue to be a reliant hedge against a falling market. Although watch take profit signals. Overview of countries effected by credit, liquidity and inflation; recession conditions – Japan, Spain, Iceland, Australia – (update 8). Australia showing a dramtic stagflation outlook. Which ever way one would look at the global economy in it’s current state, especially in the developed countries, you would be hard pressed to say that consumer sentiment is what it was 5 years ago. In fact the consumer is in recession, quite possible in every country in the world, apart from China and possibly India (although India would not be far behind). The largest economy in the world, the US economy is in a mess, with a tentative export market (thanks to weak US dollar over the last year) has somewhat propped up the GDP over any negative. But take out the export equation it would be highly likely US GDP would be very negative. America is in recession. Australia which is technically in a consumer (retail based) recession due to high food, fuel, housing (rents and mortgages); may not get a major drag on the GDP due to one industry propping up the Australian economy – which is mining. Wholly dependent (as an export market) on the continued ‘hyper’ commodity booms of China and India, which is undoubtedly causing a stagflation period in the Australian economy with inflation at 4.6%, slightly falling from 4.8%; this is above the bands of 2 and 3 percent (RBA inflation targets). With every other production trend pointing downward, infrastructure (non mining), investment (non mining) an so on. So any slowdown in Australia could be quite dramatic, as I suspect unemployment figures will come in harsh towards the end of the year with consumer spending and housing prices to drop significantly. The four states of Australia minus the mining state (Western Australia) most likely are heading into a sharp downturn towards the end of 2008. Australia may present it’s self as a classic example of a stagflation economy, more so than the US and Europe and even parts of Asia – who are all suffering from high inflation and slowing economies. The commodity markets have somewhat stabilized (although I would argue that there is instability in commodity prices – on fear of regulation) but we could see a spike too food prices, namely wheat, rice and soy towards the end of the year. Not to forget that oil is sitting on a stagnant $116-$117 price range (sans Hurricane Gustav about to hit the US Gulf refineries). Spikes in headline inflation (food, oil) may continue right into 2009. So any country that has an industry still booming on the back of Chinese demand, like the Australian mining boom; could be heading into a nasty patch of stagflation. The Australian Federal Reserve will cut rates on the 2nd September to 0.25%, from 7.25% to 7.00%. The banks will pass on little of their own rate cut’s onto the mortgage market. Global recession tipping point, gold over sold, oil price shock on the cards. Bank losses continue. The markets at the moment are dysfunctional. The US has been in recession in nominal terms since the end of 2007. A slew of economists argued throughout 2008 up to now that the rest of the world would decouple from a US slowdown. A terrible analysis and poorly throughout, luckily most people with common sense knew that the decoupling theory from the worlds largest economy is a fallacy. The world is now falling into recession, lead by the US. Still a text book boom bust cycle hasn’t really come in to play, the US has a collapsing housing market (second to the 1930’s Great Depression), the credit markets are probably not even half way becoming normalized (if ever) and inflation is still high. Europe and the UK are sliding into a sharp downturn, which is now indicating that the Eurozone is at the tipping point of a harsh recession. Japan is in a technical recession, that appears to be becoming a broad consumer based one. So in reference to traditional deflation bust cycles, the markets are showing an unpredictable dysfunction. In other words they are in the extremely volatile in an unstable way. Any investor will have a hard time making money in these markets. Despite global inflation still higher the commodity markets appear, although not entirely, finishing their bull run. The short selling recently of gold is to say the least a brave bet, this of course effected the gold price from 916 on the 1st August 2008 to 790 as of 17 August 2008; the sell off was intense and ridicules at the same time. Still shorting the commodity markets is audacious and only big institutional players would attempt it, but oil dare not come under the same sell off. As mentioned in Oil lower, volatility market reaction. Oil now showing price instability. Could the mother of all oil shocks be brewing?, anyone shorting oil will have their balance sheet destroyed and I imagine some people also got burnt (short selling) on the oversold gold price (now back into 800 range 18th Aug 2008, back to 788-789 19th Aug 2008 – from lows of 772 15th Aug 2008 ) the price still looks so oversold. I doubt we are going to see a dramatic deflation in all commodities, it all depends on the Federal Reserve rate decisions and the US dollar. With the Fed’s track record, it may be unlikely that there will be a rate increase. But even as commodity prices have declined, they still remain high and volatile. Inflation as mentioned is now flowing over to all consumer goods. If consumer prices on goods start to spiral upward, if not contained even a recessionary economy may have little effect in dampening inflation. The market hasn’t finishing wiping out balance sheets and smashing ‘zombie’ companies into oblivion. It is still disputable where the cyclical bottom to the US stock market will be, I just think there is so much more trouble out there. The en masse bank failures should due soon, of course the ‘to big to fail’ policy is in place by the Fed, but the smaller to mid size banks could ready to go under in a synchronized way. Still my concern is an oil shock that may be around the corner, Iran has test fired a satellite carrying rocket and Russia is still pushing further into Georgia. The gold bugs have cried foul on the recent price drop of gold, which has been senseless selling and risky. With gold under priced – the only relief people have holding positions with gold is to continue holding them. Like oil, gold may spike upward on environmental, geopolitical and economic crisis.